This is a review of the supplement NexGen Biolabs FocusFX. The manufacturer claims that this product is a cutting-edge supplement that can enhance memory (short-term and long-term) and cognition. It also improves memory recall, concentration, clarity, focus, and brain function. Read further to learn more about this product. The recommended dosage is two capsules once per day. They should be taken with water. Users are advised to consult a medical professional before use. Pregnant and/or nursing women should not consume this product. Children and persons with pre-existing medical conditions are also warned against consuming this product. We did not find any valid information about the actual side effects that might occur when customers use the product. However, users are advised to stop using the product and call a doctor in case they experience adverse effects. This caution indicates that there are chances of experiencing undesired effects. One bottle containing 60 capsules costs $29.99 on the manufacturer’s site. This is a reasonable price and we believe that users are unlikely to worry about the quality of FocusFX based on the price. We did not find any information about discounts for this product. The more you order the more you spend because the price of a bottle remains the same even when bought in bulk. This product comes with a 100 percent satisfaction guarantee. If you are dissatisfied with the product, you are free to return it within thirty days. You will get all your money back and no questions are asked. A money-back guarantee signifies that that manufacturer is certain that the product is effective. Such a guarantee encourages potential users to try the product because they will lose nothing if the product fails. We did not come across any customer reviews. Customer reviews are important because they allow potential consumers to know what other consumers have experienced. The absence of customer reviews may trigger quality concerns among potential buyers. 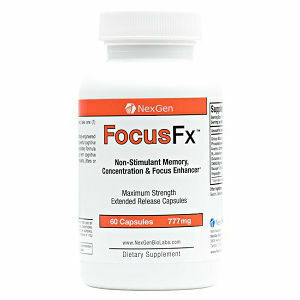 FocusFX could be the ideal supplement for memory, focus, concentration, clarity, and brain function enhancement. It is important to note that FocusFX is 100 percent natural meaning that it is safe for consumption. Additionally, this product does not contain stimulants like some of the products in the market. Additionally, the price of FocusFX is reasonable because it is neither too low nor too high. Most people can afford the product. This product also meets GMP standards. However, there are chances of developing adverse effects because the manufacturer advises users to call a doctor if they experience such effects. Furthermore, the effectiveness of the product is questionable because there are no valid customer reviews. Henry Costa	reviewed NexGen FocusFX	on June 29th	 and gave it a rating of 3.